Connecting and Using the Common Exciter or CEX Feature : Manitou Systems Inc. 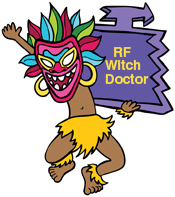 This page of the RF Witch Doctor Chronicles detail the use and integration of the Common Exciter “CEX” input and output on your RF plasma generator. This feature is provided to enable all of the RF generators (+ impedance matching networks & plasma loads) connected to a single vacuum chamber to operate at a common frequency, typically 13.56MHz. Why is the CEX needed? Let’s say that your (proposed) single chamber, RF plasma system includes two or more independent RF power sources that operate simultaneously to produce plasma discharges on their connected electrodes (sputtering guns and substrate bias stages for example). The RF systems matching and control sensors may “see” the other RF system’s power signal as it is conducted through the common plasma cloud. Why is a common frequency important ? A common frequency will keep the plasma stable as there will be no hetrodyne effect (Frequency 1 – Frequency 2 = Hetrodyne or “beat” frequency). Multiple automatic impedance matching networks will operate better if their control sensors see a single frequency. What are the symptoms when not using a CEX ? If the CEX is not used, the matching networks may not properly tune. Automatic matches may continually hunt for a tune point and manual matches may not be able to achieve a low reflected power point. The plasma discharge may beat to the hetrodyne frequency (this may not be visible to the naked eye) which could result in an unstable plasma process. Are there any other considerations when using the CEX ? The (electrical & physical) length of the CEX connection cable(s) will introduce a phase shift between the multiple RF power signals as they arrive at the plasma discharge. Understanding the entire RF signal path as it travels from the oscillator source through the RF generator, internal & external coaxial connection cables, through the matching network and finally to the plasma will allow you to select the proper cable lengths. If the Master and Slave RF generators are located next to each other, the cable length between them should be under 12″ and may not be of concern. Remember to understand the length of internal connection cables (inside of the RF generator). The RF generator’s manufacturer will be able to supply the details. Some plasma processes (RF bias sputtering of dielectrics for example) may require a variable phase shift function to enable the process to operate. This phase shift can be achieved using different lengths of coaxial cable or by using a continuously variable phase shift module that is inserted in series with the CEX output. In a “2” RF system configuration (RF sputtering and RF substrate bias), varying the phase of the RF bias generator will effect the amount of developed DC bias on the substrate – using a constant forward RF power. Connecting more than 2 RF generators may be done via a daisy chain connection using coaxial TEE connectors – this will work if the Master CEX output has sufficient output power to drive multiple Slaves. If not, then a separate CEX exciter is required to drive all of the RF generators. Use a very short cable to connect the CEX output on generator #1 to the CEX input on generator #2 – type RG58 coaxial cable is typically used – each connector end needs to mate with the corresponding CEX connector. Typical types include BNC and SMA. Most of today’s RF generators include an auto-sense function and will automatically switch its internal oscillator OFF and the CEX input ON when an input signal is present. Always verify with the manufacturer’s owner’s manual. As some CEX outputs are square (not sine) wave, they may not be compatible with the generator’s CEX input – again, verify with the owner’s manual to be sure. Bdiscom Models BDS-HF200, 300 and 400 include type SMA female coaxial connectors to enable a CEX input/output interface. The input will accept a 250mV>1.5V RMS, 13.56MHz signal from the “Master” generator. A high harmonic (square wave) signal may also be used. The output signal (to a “Slave” generator) is a 1V RMS / 50 ohm sinewave signal. See the waveform in the image to the right. To assist in calculating internal phase shift, the connection cables inside the BDS-HF is 30 cm long.